The NZ Treasury has been tasked by Finance Minister Grant Robertson with preparing a Wellbeing Budget in May 2019. To guide this approach Treasury is working together with StatsNZ to design a Living Standards Framework for Monitoring Intergenerational Wellbeing. NZCCSS is part of the Equality Network that is focusing on the importance of reducing inequality in promoting greater wellbeing for all in this country. How wellbeing is distributed amongst New Zealanders is crucial and measures of income and wealth inequality need to be central to any monitoring framework. Measuring wellbeing is a much better way to describe the state of our nation than the commonly used economic and financial measures such as Gross Domestic Product (GDP). Wellbeing is defined for the purposes of this work as outcomes that are “of intrinsic value in enabling people to pursue the sorts of lives they have reason to value.” (Conal Smith, Treasury Living Standards Dashboard: Monitoring Intergenerational Wellbeing, June 2018, p.3). Wellbeing is a multi-faceted concept and a variety of approaches are used for measuring wellbeing, including the existing MSD Social Report and the Superu Family and Whānau Wellbeing programme. The Treasury argues that while there are differences between approaches, there is also a large degree of commonality in the broad dimensions of wellbeing and the indicators that are used to measure them. (Living Standards Discussion Paper 18/01, Feb 2018, p.i). The headline measure proposed is called overall “life satisfaction” based on surveys like the NZ General Social Survey that askes people how they rate their overall life satisfaction. Together with this there are 11 key dimensions of wellbeing that the proposed dashboard aims to measure. Eight of them relate quality of life (health, work-life balance, social connection, education, civic engagement, environmental quality, personal security and subjective wellbeing) and three of them reflect material conditions (housing, income and wealth, jobs and earnings). 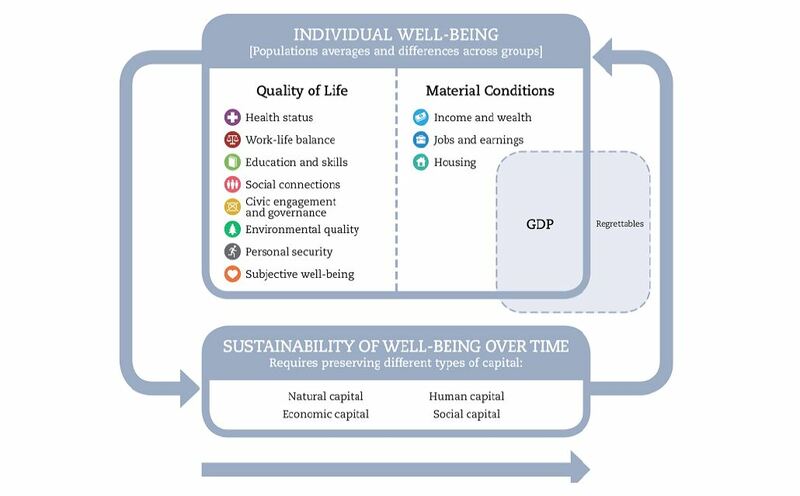 These dimensions of wellbeing are influenced by the amount of natural, human, social and environmental “capital” available that enable people to experience wellbeing. For instance, increasing economic wealth at the cost of reducing our environmental capital may well mean that overall wellbeing declines, even if total economic wealth increases. The flows and changes in the various capitals over time become important in making policy decisions about how to spend government money or what laws and regulations to put in place to influence the use of these “capitals” to improve wellbeing. It is the distribution of wellbeing that matters as much as the overall level. A high average level of overall life satisfaction in our country is meaningless if that is achieved despite a significant group of people experiencing low life satisfaction. Saying that on average New Zealanders incomes are growing is a meaningless statement if this isn’t equitably shared amongst all members of our society. If, as is the current situation, the high average is achieved through the highest 10% of income earners enjoying large rises in their incomes at the same time as nearly third of our children live in poverty, then the goal of improving the nation’s wellbeing has not been achieved. The wellbeing of all of us is tied to the wellbeing of others, and measures of inequality help us to monitor how well we relate to each other because they measure how well we share the social and economic wealth of our country. One way to do this could be to specifically include an adjustment to overall wellbeing measures to include how evenly they are shared. This is already done in one international index – the inequality adjusted Human Development Index (2016) that adjusts countries’ measurement of human development to take account of the level of inequality in that country. Treasury is asking for feedback on the proposed dashboard by the end of July 2018 but the debate will continue over the coming months as this new approach is developed and the first attempts made to put it into practice. We urge people to take the chance to give your views on this Living Standards work. We especially seek support for the call to incorporate a strong and central focus on measuring how well the various resources of our country are shared in the measurement framework.